Berlin Fashion Week day 2 outfit. My lovely co-worker took this picture of me this morning right before we headed out to see the first show (Schumacher). 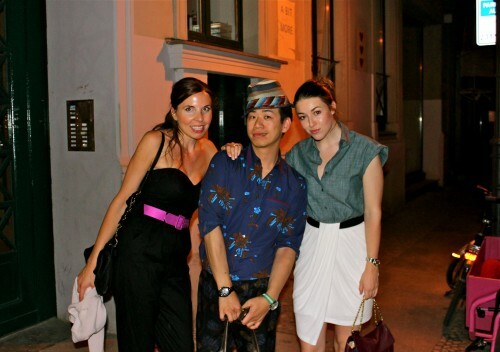 I am wearing a night blue Prada shirt all buttoned up with a swirly Isabel Marant Étoile print skirt. Oh and I just got these Chlóe sandals on sale a couple of days ago and am so in love! Their shape is completely retro – the kind of retro that is still a bit ahead of its time! Will try for a closer pic later. We went out for dinner with Runghi last night. He is by far one of the most glamorous people I’ve ever met and never fails to inspire me. He has an impressive collection of Birkin bags in only the coolest leathers and shades:-). I just want to say how much I ADORE Fashion Coup!! What a lovely fashion discovery! I feel like y’all have very similar taste & style to me, so merci for the consistent inspiration. You look fabulous my love!! the skirt was definitely a good buy!! lovin’ this look…the print skirt and shoes are amazing! Love your dress! can´t wait to see you next week, amore mio! You look amazing!!! I loooooooooooooooove your outfit! The skirt is so cute!